I still want to rerecord the vocal for this one, but haven't gotten around to it. A song about reviewing the year behind and looking forward to the naughtiness of the year ahead. I play piano. I don't play piano well. I think it's new age or electronica or something. This is song #2 for the February FAWM/RPM challenges. My attempt at writing actual ambient music. The jury's still out on whether there's enough variance to keep the piece going. I had a bad cold for a month and a half. It inspired the title and the (unpublished) lyrics. I've officially run out of ideas. My brain has been nuked by the tax monster. Part of my song a week project. http://yelyah.com/song-a-week/ It was later "upgraded" to include a spoken vocal and sound effects. Stay tuned for "wake me up" which is that version of the song. It's kind of 2 songs in 1. Is the rhythm too disjointed in the first part, you tell me. Not really thrilled with this one, but it does mark the first that I've used a time signature other than 4/4 (combo of 7/4 and 4/4 in different places). As an example of what a melodyne treatment did to my vocals. Don't cry over spilt milk, it is nothing, there's more in the fridge. From December 2007. "technique 43" was named for the Rikky Rooksby book where I got the chord progression. "time stands still" is the vocal version of that song. The companion piece to the instrumental "technique 43". You know that joke about the brick ambient synthesizer (http://possecrewensemble.com/as606/)? Yeah, I totally used that thing on this song. Who would’ve thought that the last 10 seconds would take me like an hour and a truck load of takes? And thank you Logic multi-take feature for allowing me to indulge so much time in something that was completely tangential to the song. Based on a true story. If you listen closely, you can hear me drop a half note over the course of the song. Apparently, I flounder without a pitch reference. I am not BT, so no rain drops were quantized in this production. Storm was recorded last night on my Tascam DR-07 (with wind filter and limiter). Just a simple piano improv. That of course had to be tweaked far out of the improv stage. More Ace of Base, less Enya. There's a note that sounds like it's getting abruptly chopped off somewhere in the song. Hopefully, you won't hear it, because I couldn't figure out what was causing it. Grieving via bagpipes this time. More solo piano. Yay. I'm also doing my own version of the 24 hour challenge... the wrong way. This is day #1 of that challenge. flute/bass/drums, kinda jazzy, upbeat I admit, the title has nothing to do with the piece. It’s a reference to the morning I had. Yelyah v. Squirrel. lullaby featuring piano (but of course!) Notes: Today I learned how to add an insert effect to the master channel. The song was way quiet so it got boosted via a limiter. Hurray. “Donar”, a title that’s an obscure shoutout to the German Reason users. This is an updated vocal of the song I wrote during FAWM/RPM. I *had* thought that this was an improvement but when I listened to it later that night, it ended up just sounding like a *chorus* of flat-ness. Kind of a chillout, lullaby type tune. — Notes: I think the shaker comes in too strong. I think the intro goes on for probably 1 or 2 more phrases than it should. With this sub-1-minute, A-section-only piece, I win FAWM. Not to sell this piece short, but after yesterday's grueling session, I'm just happy to have written anything at all today. And how was *your* Friday night? Here I try to see just how far I can push 4 chords (that I ended up stripping down to a 1 note bassline). I excel at disappearing for long stretches, eh? I think with this I'm officially committing to doing FAWM. And R.I.P. my songwriting drought. August 27th, 2009 - February 1st, 2010. 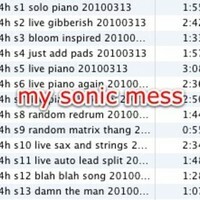 March 13th, 2010 8am CST - March 14th, 2010 9am CDT The goal: to write 24 minutes of music in 24 hours. The result: THIS.